Dignity Village called a press conference this evening to discuss our future plans, and the new site the City has asked us to move to. Dignity Village wants to continue working with the City over the next sixty days to initiate a pilot project to pursue its long-term goals. However, Villagers and supporters have grave concerns with the proposed city-owned site located at Sunderland and NorthEast 33rd Avenue. 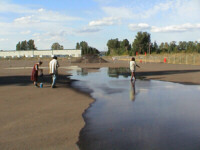 The Sunderland site is on an asphalt leaf-composting lot next to the Columbia River Correctional Institute. In a couple of weeks, the composting will kick into high gear, and the lot will be full of heavy machinery. The lot is also used for breaking rocks. The site allotted for Dignity is a portion of this lot, fenced-off with chain-link and barbed wire. The biggest problem with the site, however, is its distance from the urban core. It is two miles from the nearest grocery outlet, which is a convenience store, and fourty minutes by bus from the downtown jobs, schools and social services most villagers still depend on. The City asserts that the goal of the Dignity Village pilot project is to demonstrate how it can be part of the homeless services Continuum of Care. Yet the proposed site is so far away from other services, that it’s difficult to understand how that will be possible. Despite these draw-backs, Village residents were initially prepared to accept the site, primarily to avoid a confrontation with Police, and since no other sites were offered. At the City Council meeting last Thursday, several City Commissioners themselves acknowledged that the site was "inadequate," and that they could "do better." Commissioner Erik Sten agreed, but said it was the best the City could do before the Village’s September First moving deadline, which it had already extended for four days in order to prepare the Sunderland site for the Village’s arrival. 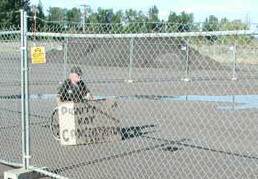 The September First deadline was requested by ODOT, the landowner of Dignity Village’s current site. At the City Council meeting, Villagers reluctantly agreed to move to Sunderland to demonstrate their good faith in working with the City. The Village hoped very much to avoid confrontation and to simply be allowed to peaceably pursue its long term vision. At the time of the City Council meeting, most Villagers hadn’t even seen the site for themselves. Over this last weekend, however, they got the chance to go out to Sunderland and 33rd and take a look. Frankly, they were horrified by what they saw. They saw first-hand how far from anything it was, even a pay-phone for emergencies. They saw themselves surrounded by chain link fence with barbed wire. They saw how even a small amount of water run-off forms large pools in the middle of the lot where the tents would be located. And yesterday morning, they met with the head of the City Bureau of Maintenance, who said she had safety concerns with Dignity Village being sited there. Now that the Villagers have seen the site, they have concluded that they simply cannot move that far out of town, especially under such dire conditions. As one Villager said, "It’s setting us up for failure. It’s not close to anything. It’s humiliating." If they are ever to hope to get off the streets, they need reasonable access to schools, counseling, showers, parole, probation and other appointments, and to commute to work at odd hours. They also need access to grocery stores, a pay phone for emergencies, and other urban infrastructure, to sustain a functional village. Since most of the Dignity community can not move to this site, relocating would amount to a de-facto disbanding of Dignity Village. To preserve its integrity, the Village has no choice but to ask for a further extension at this time. Dignity Village is exploring several promising options for an alternative site that could materialize over the next several weeks. Given the inordinate cost of trying to make the Sunderland site inhabitable, and given its disastrous consequences for the Village, it is imperative that they remain at their current location under the Fremont bridge for up to sixty days, or relocate to a more suitable site for that period, if one can be secured. Thus, in order to avoid disbanding altogether, they personally appeal to Mayor Katz and Governor Kitzhaber to be allowed to remain peaceably at the current site for an additional sixty days, or find a more reasonable site for that period.